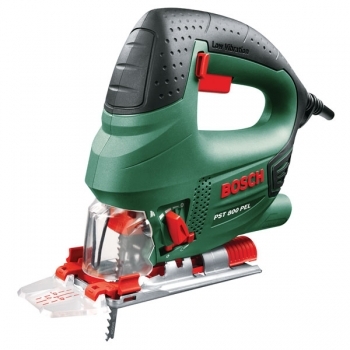 The Bosch PST 800 PEL Compact 530W Jigsaw is a small tool with large possibilities. This impressive jigsaw from Bosch enables you to cut precise straight lines or intricate curves with ease. Its compact size, low weight and great handling ensure optimum control and comfort. This compact jigsaw features a mighty 530 watt motor and a cutting depth of 80mm making is suitable for all your cutting needs. Its 4-stage orbital pendulum action makes for a faster sawing process, better sawing of curves and longer life of your saw blades. The innovative Bosh CutControl enables you to easily and safely track your cutting line optimising prevision and control. This compact jigsaw also features a switchable air blast function to keep the cutting line clear of debris at all times. You can also control the stroke rate using the trigger switch for an easy sawing start and material specific working. Bosch Low Vibration is ensured with liner mass balance and this compact jigsaw’s ergonomic Softgrip transfers minimal vibration allowing for safe and comfortable working and the robust sole plate gives steady guidance. Bosch SDS means the blade changes are effortless, safe and only take a matter or seconds, plus up to 6 saw blades can be stored in the integrated saw blade storage compartment. Knowing the Bosch PST 800 PEL Compact Jigsaw best price offers great value, as it also features a dust extraction port which can be used with a vacuum cleaner for dust free working - in the process making it a true market leader.